Brett McEntagart was born in Dublin in 1939 and studied art at Dartmouth College, New Hampshire and Colorado University, USA, where he was awarded a Masters of Fine Art. He later studied Printmaking at the Salzburg Academy of Fine Art in Austria. He was elected a full Member of the Royal Hibernian Academy in 1980 and served as Secretary of the Academy from 1982 to 1987. He then resigned as Secretary to spend a year painting in France and was re-elected to the post in 1997 for one year. He subsequently served as Treasurer from 2001 to 2005. He also served on the National Gallery of Ireland’s Board of Governors form 1993 to 1996. McEntagart taught for many years at the National College of Art and Design and was Head of the Printmaking Department there. He exhibits regularly in Dublin and throughout Ireland and has also shown in France, the UK and America. 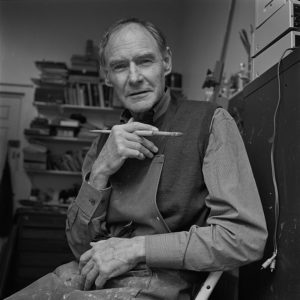 His first solo show was in the Molesworth Gallery in Dublin in 1966. He also travels regularly to Europe on painting expeditions. His work is held in many collections, both private and public notably the OPW, the National Self Portrait Collection, Limerick and AIB Bank.